By reading the calendar, we can know what year, month, and day it is. What is the 10th month of the year? Counting down the list, we see that October is the 10th month. Alex's birthday is in March. Sara's birthday is 2 months later. 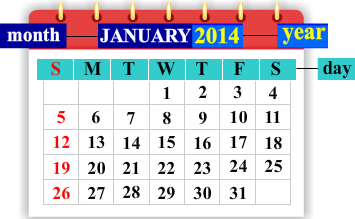 In which month does Sara's birthday fall? March is the 3rd month. April is the 4th month and May is the 5th month. May is 2 months later than March. Sara's birthday is in May. Each day in a month is assigned a specific number. How Many Days are in Each Month? Not all months have the same number of days; some months have 31 days, some have 30 days, and one month even has 28 (or 29) days. It can be difficult to remember how many days are in each month! One way is to use your knuckles and the spaces between your knuckles to represent the months. Imagine that the four knuckles on your hand are mountains and the spaces in between are valleys. Start from one side of your hand, with January on top of the first mountain. February then is in the first valley, March on the second mountain, etc. When you reach the last knuckle on your hand, continue on to the first knuckle on your second hand. The months that are on top of the 'mountains' have 31 days. The months in the valleys have 30 days, with the exception of February, which has 28 (or 29) days. February is different from the other months. It has 28 days, except in leap years, when it has 29 days. Leap years usually falls every 4 years. The actual rules for determining if a year is a leap year are slightly more complicated than this. First, a year has to be divisible by 4. 2004, 2008, and 2012 were all leap years because the numbers 2004, 2008, and 2012 are all divisible by 4. Second, years that mark the turn of a century are not leap years, except those that are divisible by 400. 1900 was not a leap year but 2000 was a leap year (the number 2000 is divisible by 400). Leap years are used in our calendar so that our calendar years stay aligned with the rotation of the earth around the sun. Does August have 30 or 31 days? August is on top of the mountain (knuckle), so it has 31 days. How many days does November have? November is in the valley (between the knuckles), so it has 30 days. Zed turned 5 years old on April 11th, 2012. On what date was he born? To find the date when Zed was born, Subtract 5 from the year 2012. Zed was born April 11th, 2007. Tia was born on September 20th, 2011 and her brother Benjamin was born on December 20th, 2013. How much older is Tia than Benjamin (express in months and years). If we subtract 2 years from December 20th, 2013, we get December 20th, 2011. December 20th, 2013 - 2 years = December 20th, 2011. September falls 3 months before December. So, Tia is 2 years and 3 months older than Benjamin. A year is divided into 12 months: January, February, March, April, May, June, July, August, September, October, November, December. 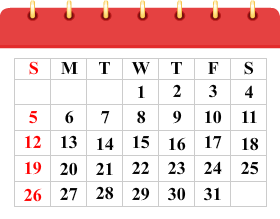 Each month is divided into approximately 4 weeks. Each week is divided into 7 days: Sunday, Monday, Tuesday, Wednesday, Thursday, Friday, and Saturday. All months do not have the same number of days. To remember how many days each month has, we can use our knuckles and the spaces between them. 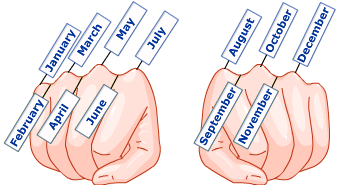 Months that are on top of your knuckles have 31 days, months that fall in between the knuckles have 30 days, except for February which has 28 days (29 days in a leap year).